We know, as experienced and outstanding and humble parents, that we aren’t really expecting to hear “Thank you,” nor “You’re the best parents ever,” nor “You were right!” until we’re 85 and 86 years old. But I must admit, this little note I found today (inside a cookbook???) made my eyes get moist just a wee bit. This card is probably three years old. Our little Colombian princess is such a sweet girl, everything we hoped for with dimples thrown in to make her daddy swoon. That’s me in the red shirt, obviously, because I don’t have a pointy left ear. Not sure why the sides of my mouth go down at the end of the smile because I’m happy. Real happy. Grab the tissue for the inside message. Gets me every time. The last sentence about a home is the one that wrenches my heart. 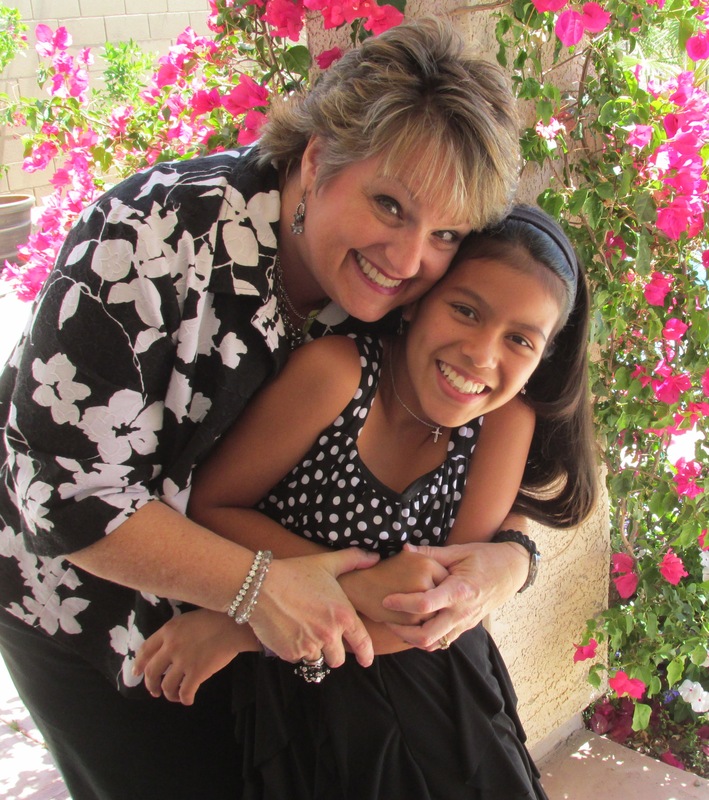 She didn’t have a home… until God tugged at our hearts and we listened. Adoption rocks, people. I have been noticeably missing from My Sister’s Jar for two months….well, at least I noticed I was missing. We have had another bump in the ever bumpy road of our lives, but we carry on, get back in the driver’s seat and plead for God’s help once again. It was May when our little Colombian princess was tested at a reading specialist and several (meaning more than 5!) different learning differences were detected. This was an AHA! moment for me as well as a WELL- DUH! moment mixed together. I assumed some of the difficulties were because Nora has only been speaking English for four years. This didn’t seem to apply at all once the road blocks to learning were identified. I believe I have mentioned on here before some of my frustration teaching my own children who can’t seem to remember what I’ve taught them, and don’t really care that they can’t remember, and just want to go outside and look at clouds and dig in the dirt. 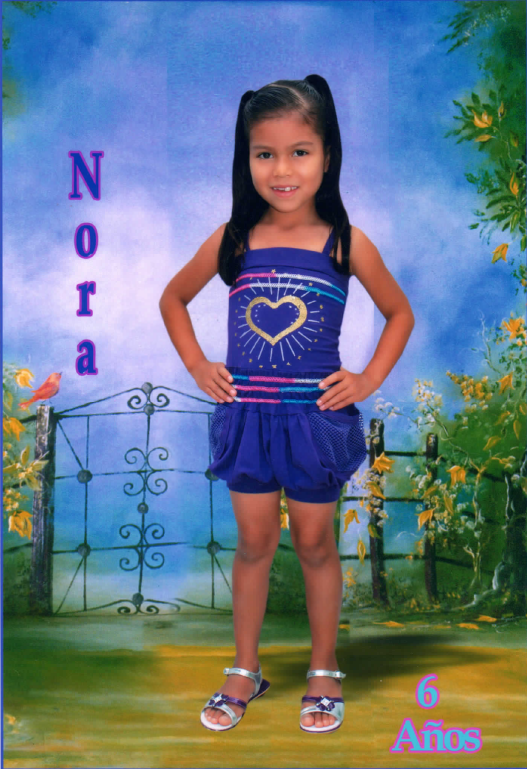 I handed over Nora’s math teaching to her two older brothers for several months at the suggestion of our principal, my husband. It saved me from the desire to bang my head on the kitchen table when there was no recall of ANYTHING she could do yesterday.The boys didn’t seem to mind re-teaching carrying, borrowing, multiplying with zeroes over and over and over and over and over again. I did mind. It is a weakness of mine, as a homeschool mom, to want my children to learn and retain and move ahead, especially in phonics, reading and math. Nora is attending reading classes with a specialist who understands left brain/right brain connections that need to be established. The “reading class” consists of physical activities outside to help cross the mid-line of the brain. School has taken a decidedly different look this year, with WAY more focus on my part, which has introduced me to a new level of exhausted. From 9:00 p.m. to midnight was MY time to get my work done. Now I’m dragging through dinner and looking at the clock longingly at 7:30 p.m. without the energy to get anything done. But God knows what He is doing. None of Nora’s challenges were made apparent until Austin was graduated from high school. The Lord knows what we can handle and what would throw us head over heels into the loony bin, and obviously teaching Austin and Nora (the new way) together was beyond my capabilities. And I am thankful we learned about all this when we did! So as I start each new day, as a homeschool mom, around 8:30 a.m. or 9:30 a.m., I remind God that these are really His kids, and I need His help once again to leave my bedroom and teach them how to learn, how to love God and how to succeed in life! I could not do this on my own! And that’s a fact, Jack! Today was the long awaited day when I took the Colombian princess to a reading specialist for testing to determine if this homeschool mama had just “lost her touch” or if there is something else going on in that cute little dark-haired, dimpled head. As requested upon arrival, I sat at the table with the teacher and my daughter the whole four-hours-when-I-planned-on-getting-stuff-done time. When she initially stated “stay during the testing” I translated that to “be in the house” not “pay attention for four hours.” My mistake. So this is what I learned from the testing: I have OCD WAY worse than I originally anticipated. There were crumbs on the table…. WITH the animal flash cards and the blue and white bottle caps used for Morse code. I believe I was the only one who noticed them. Miniature crumbs…. a red hole punch, bread crumbs, half a staple and (gag-reflex warning) a fingernail. EWWWW. Just EWWW! But my self control is also WAY more advanced than it used to be. Those items are STILL on that table… and I’m not there to worry about them any more. The plaid and sunflower placemat would have needed to be removed for me to put ten animal flash cards in line. WAY too much going on for this sister. I’m not sure what that means…. it could also be OCD, but visual clutter makes me crazy. Hmmmmmm. This could explain a few mountains I have to climb every time I want to work at my desk. My auditory memory is quite good for letters and words, but not for numbers. This was a test for an 11-year-old and I knew I couldn’t pass it. A sheet with numbers 1-100 (in order) was placed on the table and she was given three sets of instructions before she could follow the directions. “Draw a line from 27 to 34. Draw a line from 78-79. Draw a line from 17-20.” Bam. That was it. By the time drawing commenced, I could barely remember the last combination of numbers, let alone the first two sets. And math was my favorite. I love numbers. I simply don’t remember them. This may explain why I can’t tell Mr. Wallet how much groceries were upon returning from the store. I don’t know! Look at the receipt, Mr. Math-a-Holic! Walking backwards on a balance beam is hard, especially toe to heel. The good news is, after discussing my case of dyslexia for the first time in history with a professional, mine is a very minor impediment. A one on a scale of 1-5. Which I knew, but it was my very first diagnosis and I’ll be the last number of the 40’s in a few weeks. That’s a long time to go through life knowing something is different and never having discussed it. All my skeletons are now out of the closet. So the testing was all worth it. We got a two-fer! 2 for 1 and the specialist didn’t even know it. As of this past week, we have lived in the USA for 18 long years. Here’s the update on the past 216 months. We came from Canada with two kids, ages four months and three years. Now we have four kids ages: 21, 18, 16 and 11. We have lived in five places since arriving: one month at my parent’s house, 16 months in an apartment, 6 years in our first house, 6 months in a rental house and now almost 10 years in our current house. Our eldest went to a charter school for kindergarten and grade one. We are in the middle of our 14th year of homeschooling. Now our eldest is a junior in college. Rick has worked in credit card processing, flying for FedEx, had a janitorial business, a bug business and has been flying for the State of AZ for 14 years now. We went to our first church for 18 months and then helped start a sister church where we attended for 11 years. We have been at our current church for five years five months. I have been heading up to Prescott for scrapbooking retreats for 17 years.… but now they are just relaxing retreats. 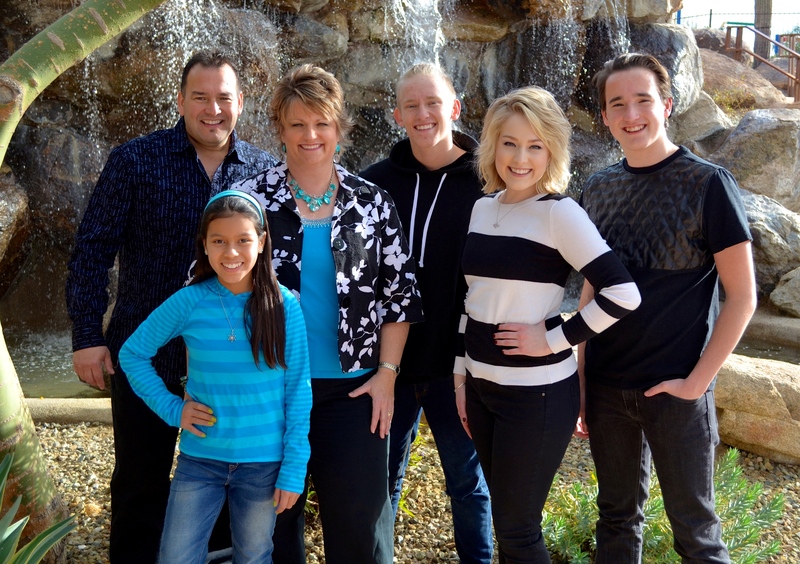 We have been serving on the board of Arizona Families for Home Education for 4 1/2 years. 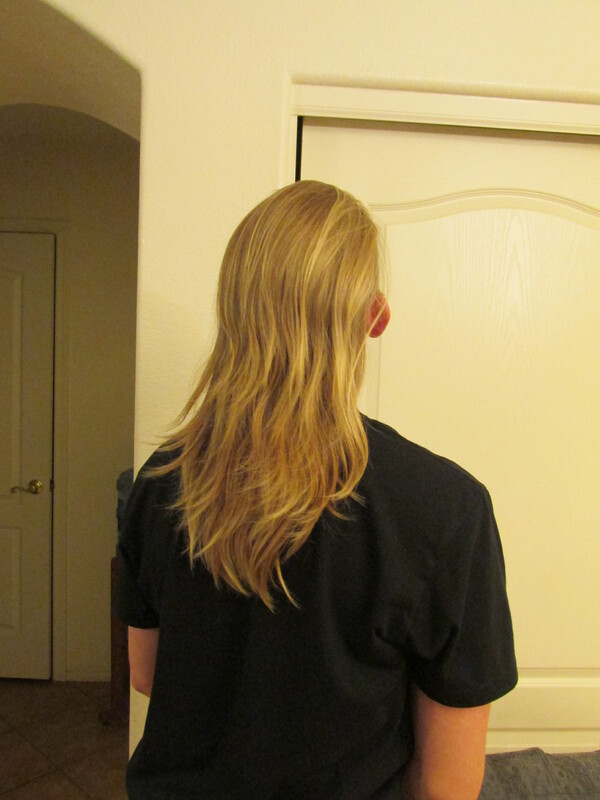 It was a sad day for me when my eldest daughter decided to donate her beautiful long blonde hair. Yes, it was selfish of me, but there…. I said it. I was sad. I was also proud that she thought of others… and started a trend in our family three years ago. 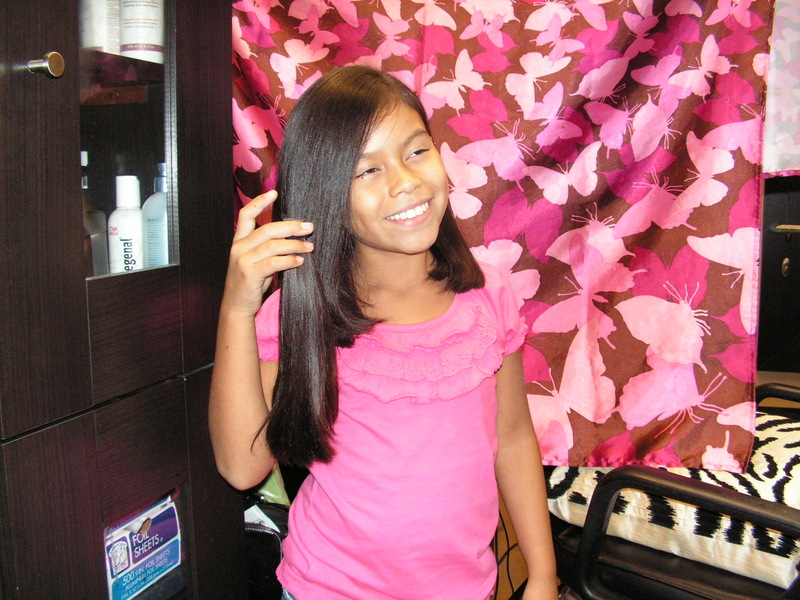 I was glad when my youngest daughter decided to donate her beautiful long dark brown hair. Yes, it was selfish of me, but there…. I said it. I was glad. I was the one who had to comb through it and watch her overly dramatic face when I hit tangles. I was also proud that she thought of others… and kept the trend in our family going. 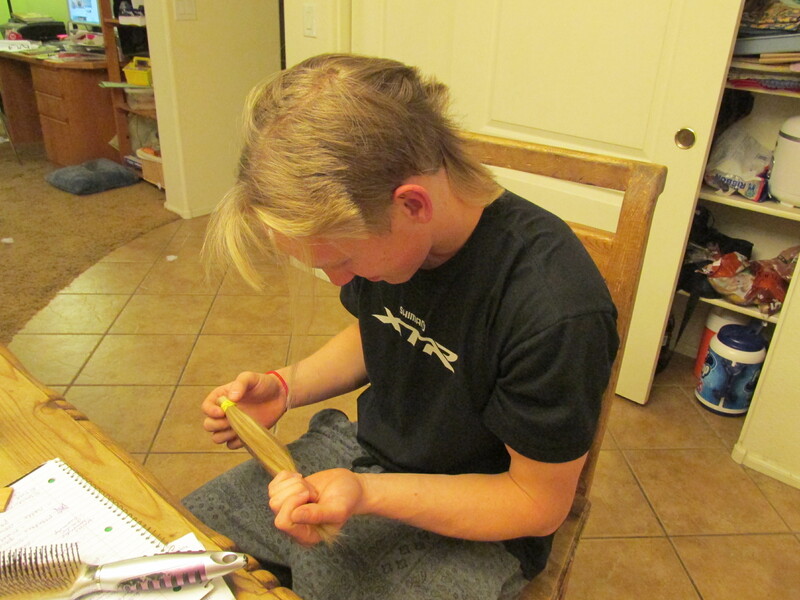 It was a HAPPY day for me when my eldest son decided to donate his beautiful long blonde hair. Yes, it was selfish of me, but there…. I said it. 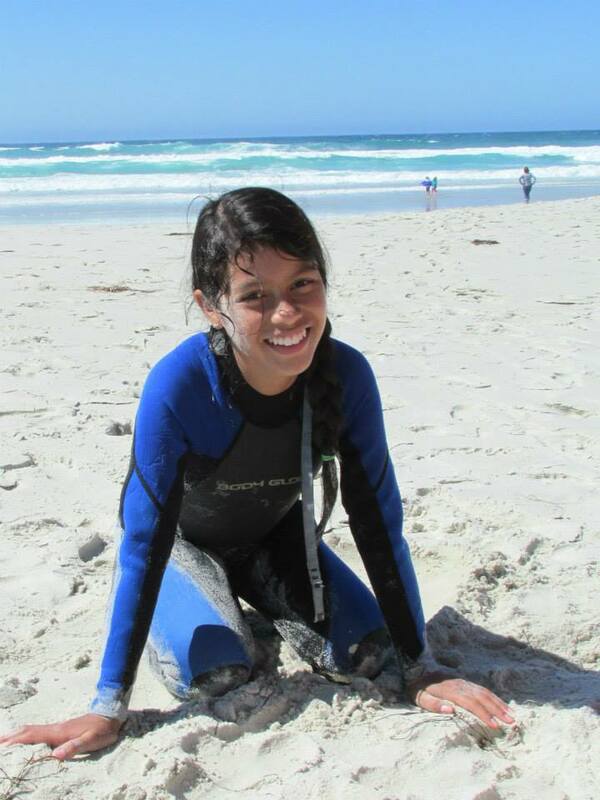 I was HAPPY. I was also proud that he thought of others… and continued a trend in our family last night! I’m not quite sure how I feel about three of my four children being able to donate their hair….. I’m thankful that son #2 told me he would never grow his hair that long. 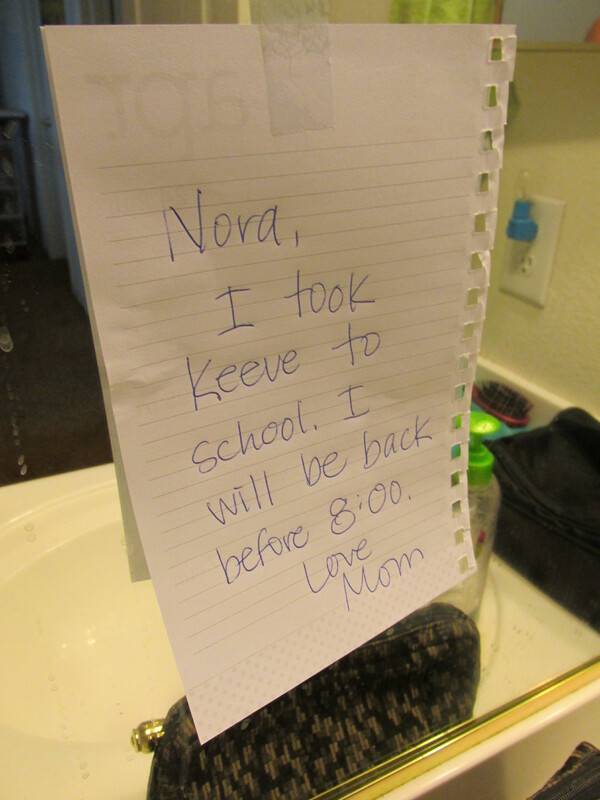 Thank you, Keeve! On a side note, we researched the companies where you can send your chopped off ponytails for donations. There are some shady companies out there who sell the hair you send them. 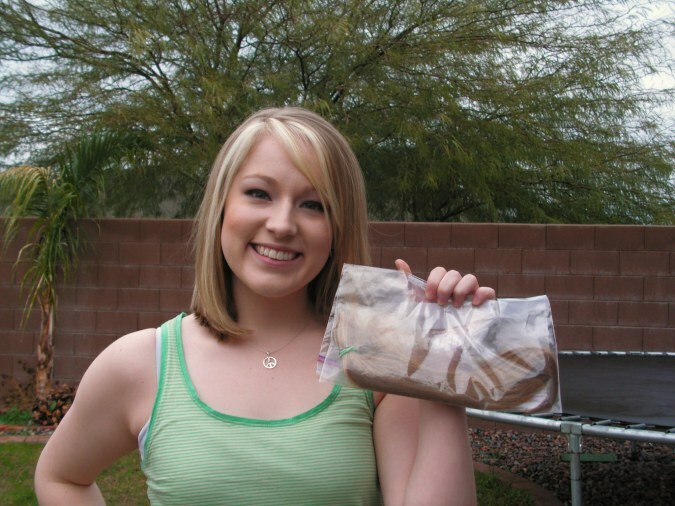 Do your research before you mail your hair! Does God still Speak Today? Almost four years ago, God spoke very plainly to me four times within a half hour through a Christian radio station. Now quit shaking your heads, you naysayers! Read on, and judge for yourselves. We accepted an adoption referral for our little Colombian princess on a Friday night in November 2010. We assumed with Colombian courts closing from Dec. 15 – Jan. 15 we would be traveling to get our daughter in the new year. We discovered on Saturday that we could actually complete all the in-country paperwork IF we left for Cali, Colombia in FOUR days. That’s 96 hours, in case that seemed like plenty of time to you. We purchased our plane tickets on Sunday night for the following Wednesday, and then my Dad and I drove seven hours one-way to the Beverly Hills, California Colombian Consulate to obtain our visas. At that moment, feeling feeble and vulnerable before the God of the universe, I looked out the side windows and was surprised that I could see the cacti and sage brush on the sides of the highway in the middle of the night. Craning my neck to find the moon, it was indeed one of the brightest nights I had ever witnessed in my life. Then I recognized the lyrics to the song that was playing by The Afters. O.K., Good! was my first thought! I’ve got God’s attention for a nanosecond, I better not waste this opportunity! Our funding for the adoption was only 2/3 accounted for……TWO days before departure. I sort of lamented to the Lord reminding Him that I had done ALL I knew to do for fundraising. I reminded Him (because He might have forgotten) that He funds what He favors. I had given it my ALL for four years and I had nothing left to give. (Like He didn’t know that either.) I also reminded Him that He promised to complete what He started. Then the song No Matter What by Kerrie Roberts started seeping through the speakers. Once again, O.K., Good! I was reassured that God was not surprised by this whirlwind trip to South America. So I brought up our main dilemma …. if we don’t have enough funds for our whole family to stay in Colombia for a month, should we leave the boys behind? Our boys were 12 and 14 at the time. They could have stayed with their Grandparents, but I really felt that this was a family bonding time for all of us. We had until midnight Monday to cancel the boys’ plane tickets. So I asked, “God, do we take the boys or not?” It was Tobymac’s turn to bring God’s answer to me in his song City on Our Knees. At that point, the tears streamed down my face. Our choice was clearly to stay together as a family. So incredibly awesome! So God was going to show up BIG TIME …. tomorrow, because that was the last day. The 11th hour. It was time. I couldn’t wait to see how this played out! Right after Tobymac helped us decide to take our boys to Colombia, Matthew West sang to my soul, just for some more reassurance about the whole adoption gig. Here is part of his song My Own Little World. What if there’s a bigger picture? What if I’m missing out? What if there’s a greater purpose? The remainder of the drive home was filled with thankfulness, a grateful heart, humility that we are called to care for one of God’s chosen children, and supreme faith in the God of Abraham, Isaac and Nora. I was riding higher than a kite on a faith walk that shielded my heart from doubt. I knew God was going to show up tomorrow. I didn’t know how, or through whom, but I KNEW He would. Several months ago our family found out about friends who were in need of some help. Sickness had struck their home with a vengeance and last but not least, the mama was down. RED ALERT! Mama Down! This is not your ordinary mama either. Buckle up. God, the father to the fatherless, called this beautiful lady to foster/adopt six kiddos… and homeschool them….. as a single mama. She takes my breath away. I met her at homeschool park day when her last two littles were two-month-old twins. It didn’t take much persuading for me to help hold one of those little darling girls. This mama has been on my heart ever since that day. How can we help her? What can we do to support her in this call from God? We need to be God’s hands and feet for her! While we were on duty, mama fainted and thankfully I was right next to her. Not that I helped with the descent or the crash landing, but I made sure we went down NOT on hard surfaces or pokey things or gooey stuff. See? I’m helpful! In directing her away from a wooden shelf, the back of my hand came in contact with a corner of said hard, wooden shelf. 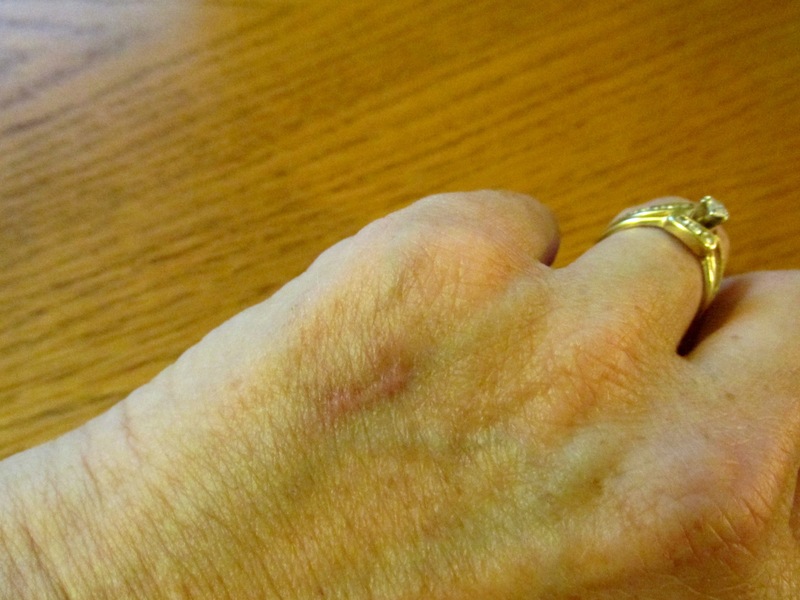 My hand was bruised, but the skin was not broken. No big deal. It’s been three months, maybe four, since that fateful day and the little mark on the back of my hand has not gone away AT ALL. It doesn’t appear to be on it’s way out of my life. It has scarred into a cute, little silvery-pink line. It winks at me every day and whispers to me that I need to pray for that mama. It’s God’s little reminder to me that we all need prayer. He will do what He needs to do to remind us daily to lift up each other to His throne of grace. My little Colombian princess went to the movies last night with her Daddy. Bedtime was delayed almost two hours from the usual schedule! This little girl sleeps 10 1/2 to 11 hours EVERY NIGHT! It is God’s little gift to ME! But, as we have experienced, she doesn’t do well with LESS than 10 hours of sleep. Tiredness makes her moody and sassy. If there’s one thing this mama don’t want is more sass in the house. ‘Nough said. This year is an adjustment to our whole household as son #2’s band class got moved to first hour at the local high school. Yes, we still homeschool, but homeschool marching band doesn’t exist so he goes to Wind Ensemble every blinkin’ morning at 7:45. 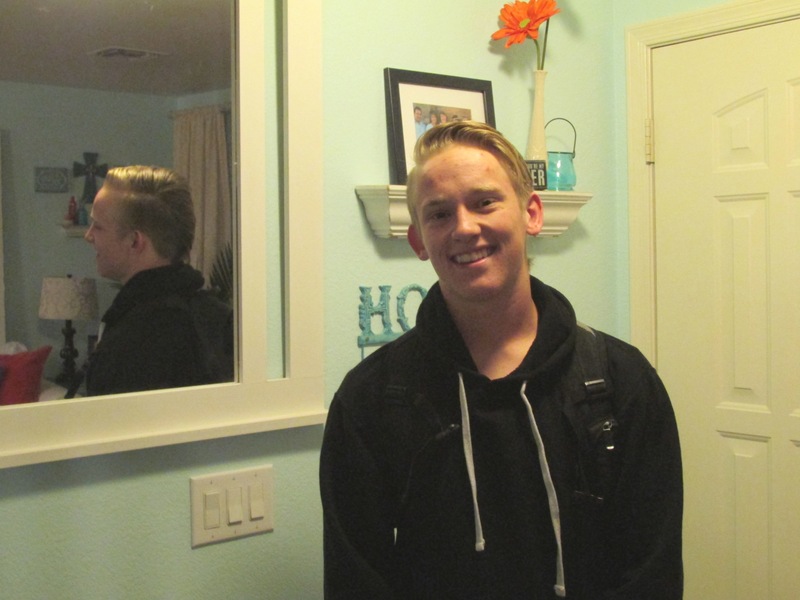 Last year I had to wake up at 8:15 to get him to second hour band…. this year will be interesting, for sure. More back story. Our little princess had a few previous issues with being left alone so we have made sure that she is NEVER by herself… ever. She is 11 years old and very responsible, but we wanted to make sure she always felt safe with us. This past summer is the first time I left her alone at the house while I took her brothers and their friends up to go swimming… two miles away. She rolled her chocolate eyes at me and assured me that she would be fine by herself with the dogs and chickens. She was. When I returned eight minutes later I asked her if she looked out the front window. “I did! Because I wanted to check if you were really going to leave me or not.” hahahaha. As I suspected, she didn’t even wake up until 8:55. But I forgot to take down the note. DOH! Thankfully I was talking on the phone and she knew I was there before she read the news of my abandoning her. Whew! Catastrophe averted. 1. “Shweediss” = Swedish…. as in Swedish pancakes, my grandmother’s delicacy. 2. “School Rock House” = School House Rock. Come on! Those are classics! 3. Inspect … “isn’t that when you save piles of things like rocks?” Um no. 4. “Ann of Grenoble.” Oh.My.Stars! Anne of Green Gables. She did not live in Russia near Chernobyl! 5. “Dad didn’t ate any.” We ain’t hillbillies no mo. One of my favorite book series is Anne of Green Gables. The summer we drove across Canada and camped on Prince Edward Island, Anne’s home, I read the series as we passed the Lake of Shining Waters and the White Way of Delight. Lucy MM’s writing is superb. The words that come out of Anne’s mouth are hysterical! She is so full of imagination and wonder at every little thing… and highly dramatic! So funny! Several months ago, I started reading a shortened version of the book to Nora, our little adopted daughter. I wondered how it would affect her, hearing about Anne’s heartbreak at not having a family. The book glossed it over pretty well and got right into the daily events on Anne’s life at Green Gables. Yesterday, I found the movie online for Nora to watch. It is over two and a half hours long so it took three sittings to finish it all. Nora sat on the end of her chair the entire movie! It was priceless. This tentative look on Anne’s face as she waits for Matthew at the train station…. it’s the same one I saw on Nora’s face the day we got her. “Will they like me?” “Am I okay?” “Will they keep me?” “Will I be safe?” “Everything changes today.” WOW! 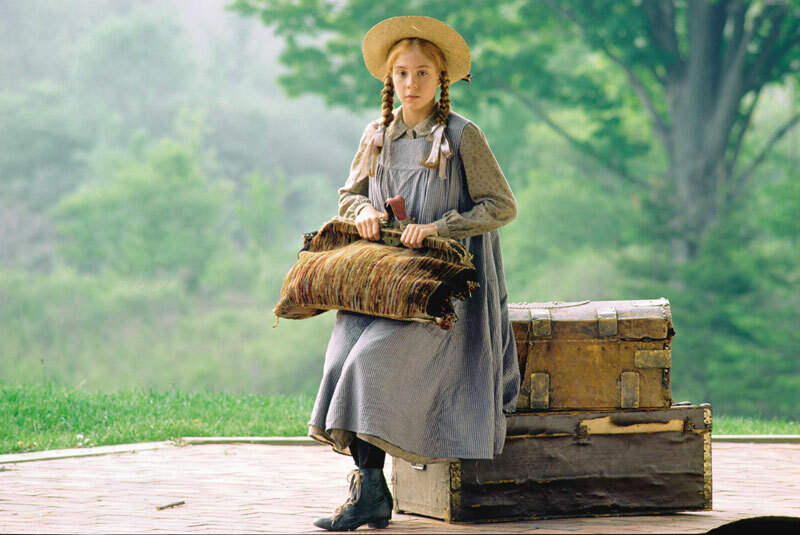 The movie does not sugar coat the fact that no one wanted the red haired orphan in the beginning. Nora didn’t say much, other than looking at me with wondering eyes and asking, “They do keep her, right?” I watched most of the movie with her, but never looking through the eyes of an adopted child until yesterday. She must have related to so much of the story. It broke my heart when the two women in the very beginning call Anne “trash”… good heavens. I didn’t even remember that part. I understood a bit more now about how Anne wanted to be called Cordelia, hoping for a different life than the one she had been given that lead her to the depths of despair. Marilla’s line was superb, “To despair is to turn your back on God.” So true! We’ve had two nights of reassuring talks that Nora is ours forever. That God never left her without someone to take care of her. That we prayed for her for four years before she was part of our family. That God chose her for us and us for her. I don’t think we can ever say those words enough. Ever.